Dr. Leroy Chiao 焦立中 is a renowned American astronaut and international space station commander. He speaks from experience on important business topics such as leadership, how to combat complacency, and essentials to bring your business to the next level. A pioneer in the commercial space sector, his accomplished track record in space, in the lab, and in the business world offers audiences an unparalleled perspective into space exploration and how lessons learned apply to businesses worldwide. His broad technical expertise allows him to offer compelling insights on future technology trends, the fascinating biomedical effects of spaceflight, and how businesses must pay attention to technology and innovation to stay on top. In his presentations, Chiao shares breathtaking photos and awe-inspiring stories of leadership, innovation, and running international teams from his four space missions, including nail-biting tales of real emergency situations, and shows audiences how his out-of-this world knowledge can impact their organizations. Few people have reached the heights in their careers that Leroy Chiao continues to experience, and he is happy to offer the benefit of his experience to inspire and enlighten others in all fields. Performance Specialist, and Innovation/Technology Futurist. Dr. Chiao’s impressive resume does not begin or end at Cape Canaveral. Before joining NASA, he earned three degrees in chemical engineering from the University of California (Berkeley and Santa Barbara), and a Q-clearance for nuclear secrets at the Lawrence Livermore National Laboratory. Post-NASA, He is a co-founder and President of a space technology startup, a cofounder and CEO of a corporate training and education company, and previously served as the CEO of a biomedical materials company. In addition, Chiao was a member of the White House-appointed Review of U.S. Human Spaceflight Plans Committee, and has testified before the U.S. Senate commerce subcommittee on science and space. He holds appointments at Rice University and the Baylor College of Medicine and is the special advisor for human spaceflight to the Houston Association for Space and Science Education. He serves as part of the NASA Advisory Council, is a member of the International Academy of Astronautics, and the Committee of 100. He is also a fellow of the Explorers Club. A trusted expert, Chiao frequently appears on television and other news media addressing science, space exploration, and international issues. For corporate/business meetings, conferences, and other events which need a unique, interesting, inspirational and entertaining speaker, Leroy Chiao offers a perspective from space exploration guaranteed to excite and inspire! 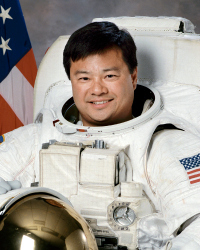 As an astronaut, Dr. Chiao developed interests in specialized topics from a unique perspective. He discusses fascinating observations and ideas from personal experiences and reflection. We all have one chance, one life, OneOrbit! In this keynote geared especially for students, Dr. Chiao talks about the fundamentals that young people must embrace in order to pursue a successful and fulfilling professional life. Using his personal story, Chiao describes the importance of not only having dreams and passions, but of also having the courage to follow that path.